House rats and mice, also known as commensal rodents, have long been unwelcome associates of humans. They followed human occupation and development of new countries and are now present in most parts of the world. In contrast to native rats and mice, they are aliens but are well-established. They eat and contaminate food. They damage and destroy property by chewing wires, which may cause fires. They destroy labels on cans and damage sacks and other containers. 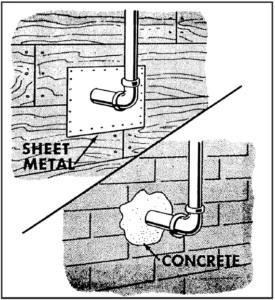 They undermine buildings, gnaw pipes, chew water hoses, and cut through mortar and cement. They damage wood doors, floors, walls, clothing and furniture. They carry diseases that are health hazards to both human and domestic animal diseases such as Typhus Fever, Trichinosis, plague, infectious jaundice, Salmonella and rat mite dermatitis. In order to control rats and mice, one must first be able to identify the species and the degree of infestation. 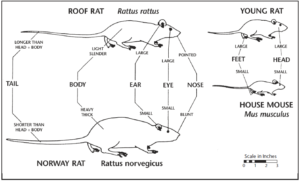 The three commensal rodents are the Norway rat (Rattus norvegicus), the roof or black rat (Rattus rattus), and the house mouse (Mus musculus). Norway rats burrow under foundations, floors, stacks of goods and rubbish. The roof rat seldom burrows. It normally nests in double walls and attics. If the nest is high, it is usually that of a roof rat. If it is underground, it is almost always a Norway rat. The smaller, neater nests of mice are often found in a variety of places such as under a pile of paper sacks, in loose or baled hay, inside upholstered furniture, and even in cabinet drawers. The signs of a rat or mouse infestation include droppings, tracks in the moist earth or dusty places, and burrows in the ground, in haystacks and in baled hay. There will be signs of gnawing, greasy smears wherever their bodies have touched walls or rafters, and runways in the grass or through trash. One can smell the presence of rats and mice, especially in a poorly ventilated room. Droppings: Numerous or just a few? Scattered or everywhere? Fresh or old? Smears: Faintly seen or very heavy and greasy? Runways: Seldom used or worn smooth by the passage of many rodents? Feeding: A solitary rodent may be quite neat about his feeding. If many feed, they may fight between themselves and scatter food. Sounds: Mice squeal continually in their nests. Rats make running and squealing noises even when not alarmed. Rodent activity increases after dark, which is the best time to listen for them. 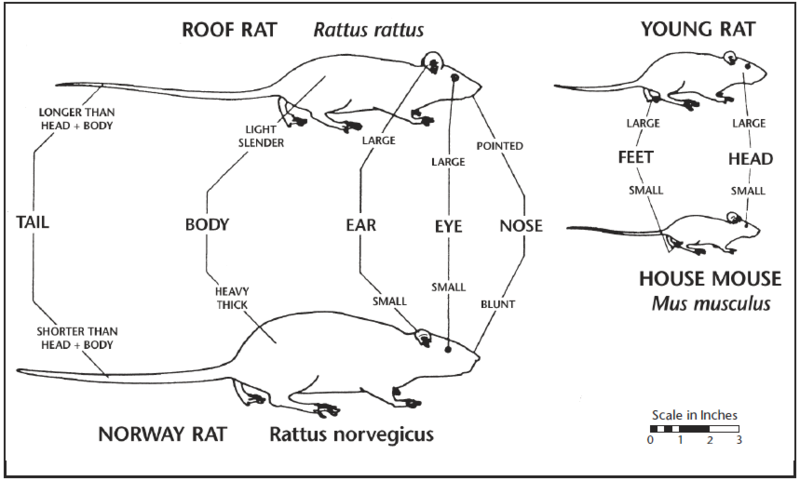 Norway rats would be considered a heavy population, but 100 or more roof rats often live in harmony. Rarely are both Norway and roof rats found living in the same structure. 3 feet (males are generally larger than females). Gray with a white underside. Shorter than body, dark above, pale below, furless. Two to fourteen, average seven to eight. Four to six per year with heaviest production of young in the spring and fall. 3 to 4 weeks, reach reproductive maturity at 3 months. 12 to 18 inches including tail. Grayish-black with a pale yellow underside. Three or more per year with heaviest production of young in the winter and spring. 3 to 4 weeks; reach reproductive maturity at 3 months. 5 to 8 inches including tail. Thirteen per year. and spring. 3 weeks; reach reproductive maturity at 6 to 10 weeks. An integrated program using rodenticides and traps, removal of shelter, removal of food and water, and rat-proofing is most effective. There are many different kinds of rodenticides available. Most are anticoagulants, which cause death by internal bleeding. Anticoagulant rodenticides are available in either single-dose or multiple dose baits. Rats and mice normally begin dying anywhere from 3 to 10 days after feeding on the baits. These rodenticides are formulated as cereal grains, pellets, parafin allweather blocks, tracking powders, or water soluble formulations. It is impossible to recognize anticoagulants by trade names alone. In the table of ingredients on the label, the active ingredient is identified by such chemical names as chlorophacinone, diphacinone, fumarin, Rival, PMP, prolin, warfarin, brodifacoum or bromadiolone. These anticoagulants can be purchased in ready-to-use forms at farm and ranch supply stores, nurseries or grocery stores. Proper placement of bait can be as important as the type of bait used, or more so. Place all baits in rodent travel ways or near their burrows and harborages. Do not expect rats or mice to go out of their way to feed on the baits, even though they do occasionally. The best idea is to locate the bait where it will be in the rodents’ normal line of travel. Results cannot always be measured by counting dead rats and mice. When baits are no longer being eaten, when there are no fresh droppings, and when no live rats or mice are seen, results are as good as can be expected from any type of bait. Although these rodenticides are generally safe to use, care should be taken in placing them so that neither people nor domestic animals have access to them. Containers known as bait boxes can be either purchased or constructed. Bait boxes protect baits from the weather and restrict access mainly to rodents, providing an excellent safeguard for people, pets, and other animals. As with any poisonous material, if ingested contact a physician or poison control center. The label directions should always be read and followed exactly. 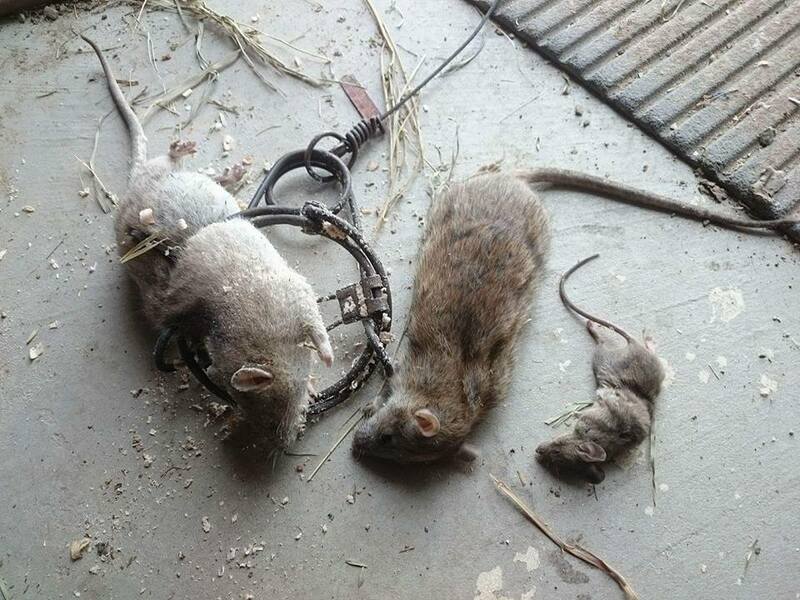 Traps are just as effective as rodenticides, but they require more skill and labor. Rodent traps include snap traps, cage traps and glue boards. They are recommended where the use of rodenticides seems inadvisable, and in places where there are few rats and mice. The best place to set traps is along travel routes where rodent sign is evident. Snap traps should be set perpendicular to the base of the wall and in such a manner that the rodent, in following its natural course, will pass directly over the trigger. To make the trap more effective, a 2-inch by 2-inch piece of cardboard can be attached to the trigger. Glue boards and cage traps should be placed parallel to the base of the wall. The selection of baits for trapping is important. Baits should be fresh and changed daily. It is more effective to use a variety of baits on successive traps than a single kind of bait. Fruit, peanut butter and nuts all make good baits. 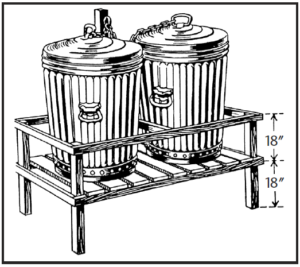 Commensal rodent shelters are provided by lumber piles, accumulations of trash and other stored materials. Waste, such as empty boxes and cartons, should be disposed of promptly so that it will not serve as harborage for rodents. Materials should be stored at least 18 inches off the ground or floor, and with space between the material and the wall. Fig. 1. Garbage should be stored in metal containers and placed at least 18 inches off the ground. 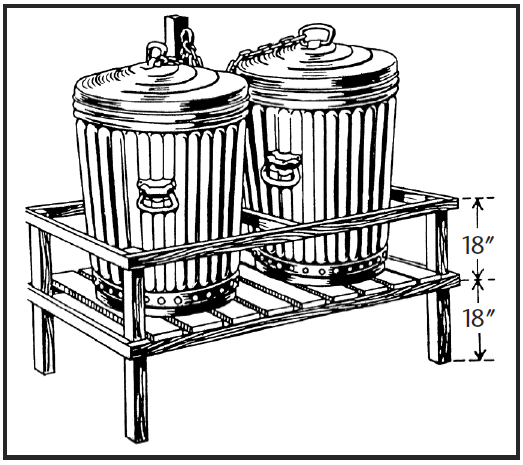 The best way to eliminate the food supply is to store foodstuffs in rodent-proof containers such as glass or metal, and to dispose of waste and garbage in tightly covered metal cans (see Fig. 1). Mending leaky faucets and doing away with water storage areas that rodents have access to also is an essential part of rat and mouse control. Whenever it can be accomplished at a reasonable cost, rat-proofing is recommended as the most permanent means of control. All openings rodents can enter should be covered with rat resistant materials such as 1/4-inch hardware cloth or steel wool. Doors should be closed when not in use, and all edges subject to gnawing should be covered with metal. 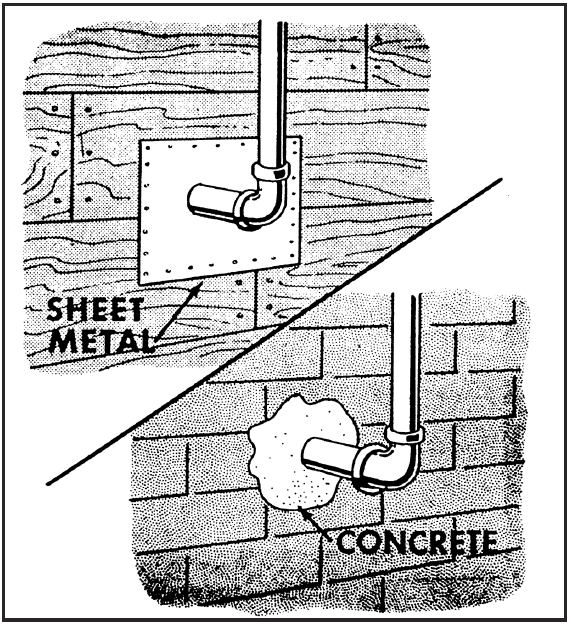 Unnecessary openings should be covered with concrete or sheet metal (see Fig. 2). Concrete also can be used to prevent rats from burrowing under foundations. Fig. 2. Openings can be sealed with sheet metal, concrete or similar materials. Roof and Norway rats and mice are not protected species in Indiana and may be taken at any time. Individuals with nuisance wild animal control permits can assist homeowners with nuisance rats or mice. The names of licensed nuisance wild animal control operators and additional information can be obtained from the Indiana Wildlife Conflicts Information Hotline at 1-800-893-4116.